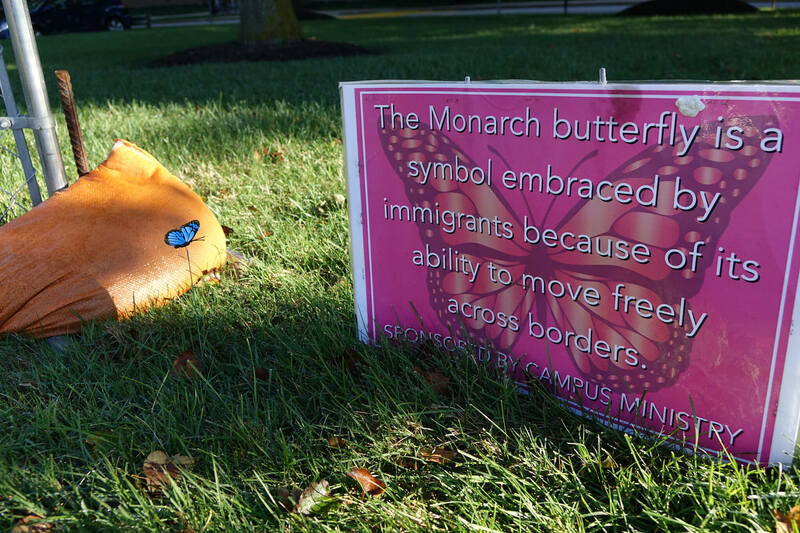 On a crisp morning in the Fall of 2015, John Carroll University’s campus awoke to an unusual sight. At some point during the previous night, student supporters of Donald Trump had written “Trump 2016” in chalk all over sidewalks, buildings, and statues around campus. 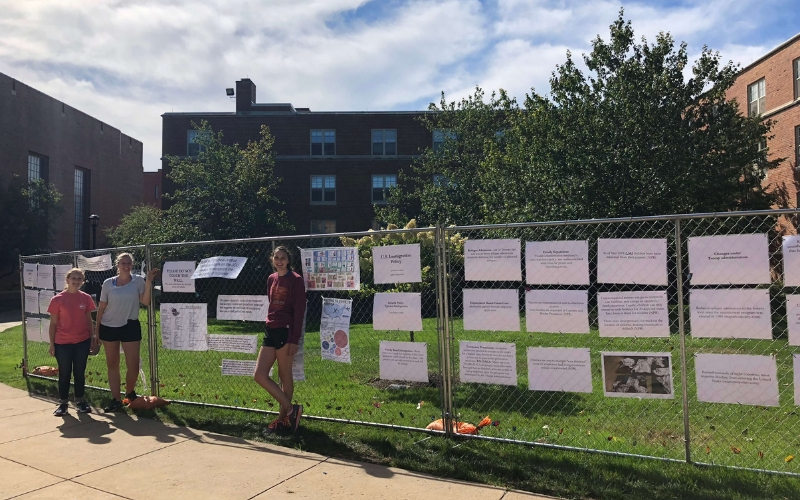 Word quickly spread that this was in response to the mock border wall which had been erected on campus the previous day as part of then-senior Grace Donnelly’s Arrupe advocacy project. 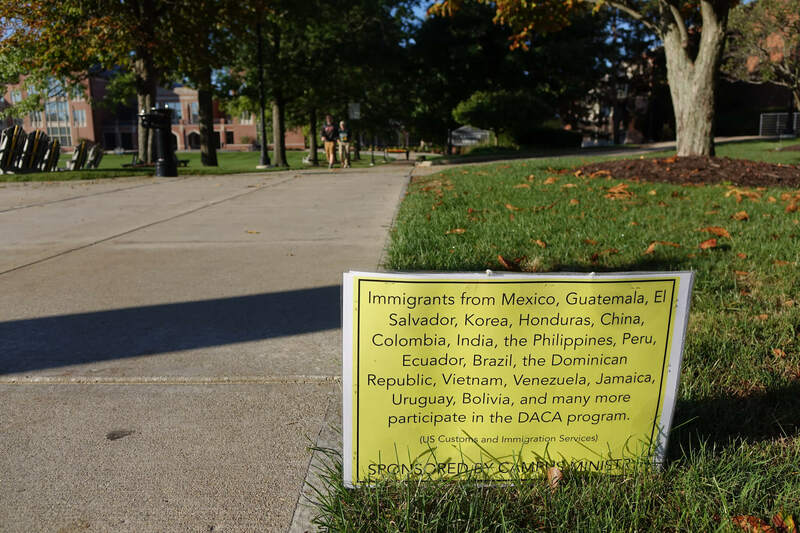 In an effort to bring awareness to the dehumanizing language and misinformation that had been permeating political debates on immigration, Grace set up two sections of chain link fence on campus: one in front of the library, and one in front of the student center. 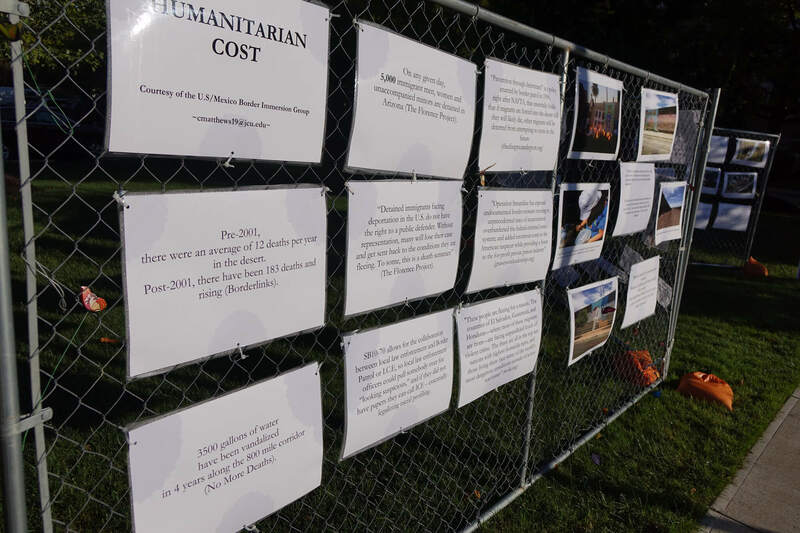 Hoping to start a conversation on campus about the human toll that anti-immigrant sentiment and policy takes, Grace covered these mock border walls with images, quotes, and statistics on immigrants and refugees. 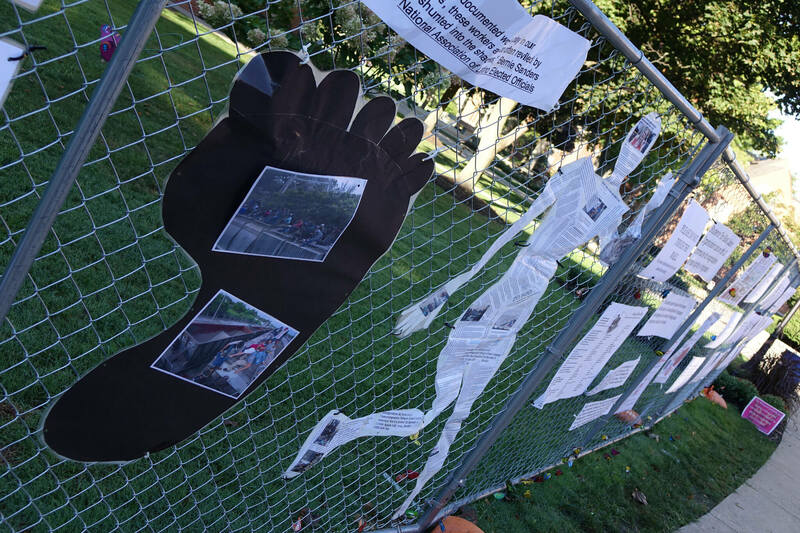 During the week that these fences remained on campus, a conversation was ignited. Tensions rose between Trump supporters who attempted to deface the wall and other students who sought to protect it, culminating in a very heated rally outside of the Student Center. 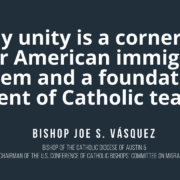 Although at times the conversation turned quite vitriolic, it was clear to everyone that Grace had succeeded in bringing attention to the consequences of anti-immigrant sentiment in the United States. 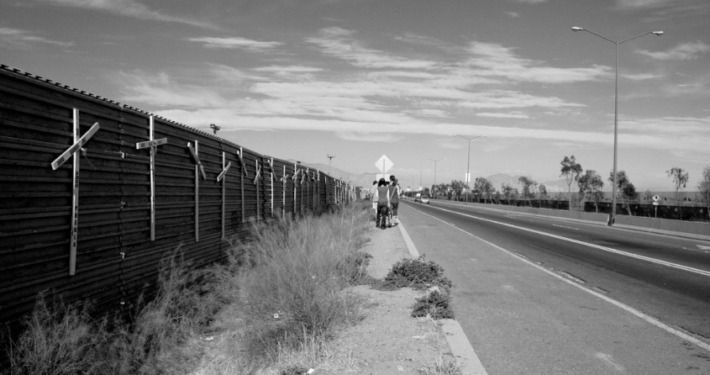 Over the course of the next several years, while attention to immigration slowly slipped from the campus’ collective conscious, students who had witnessed the wall continued to discuss it, and the events surrounding that week gained somewhat legendary status. 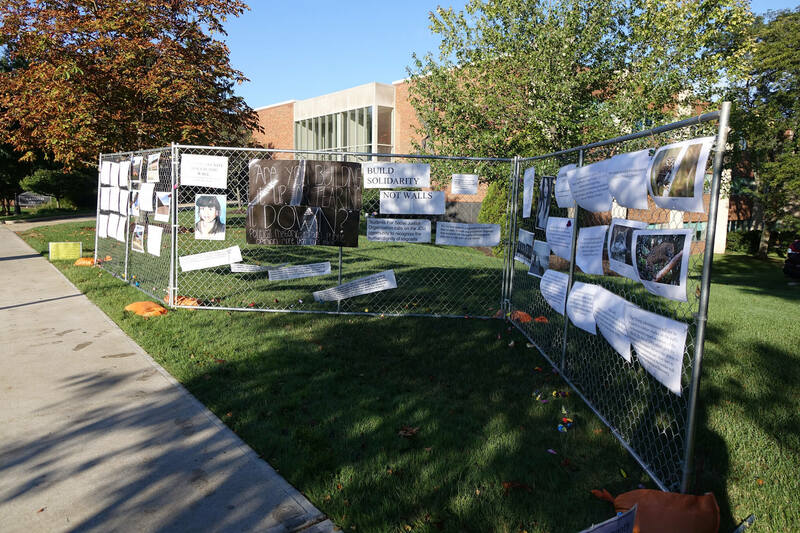 The authors stand with the mock border wall at John Carroll University in fall of 2018. 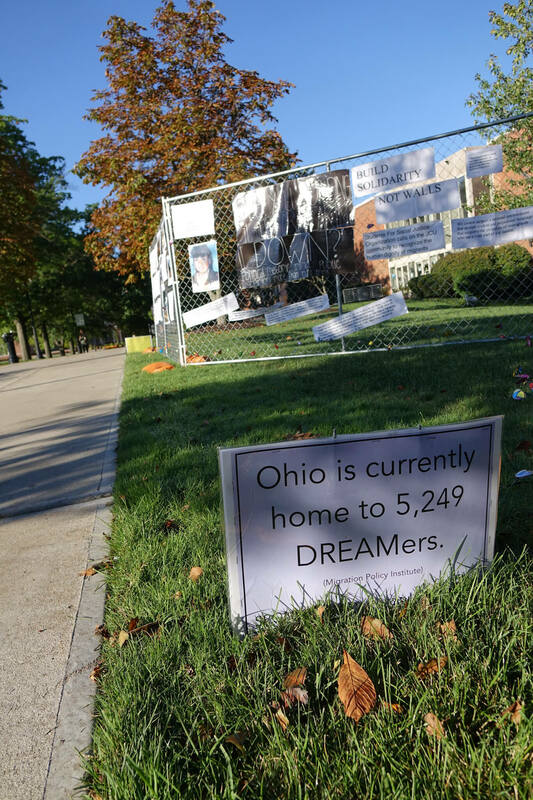 When we became the co-presidents of Students for Social Justice at JCU last spring, we knew that we wanted to bring the mock border wall back to campus. We had seen how it was able to spark dialogue, reflection, and intrigue among students, and we felt that it would be an exceptionally powerful way of renewing the conversation on immigration. 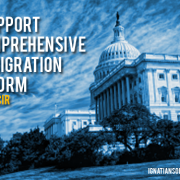 While anti-immigrant rhetoric had subsided somewhat from its height during the 2016 election, it has continued to have serious implications within U.S. society over the past three years. 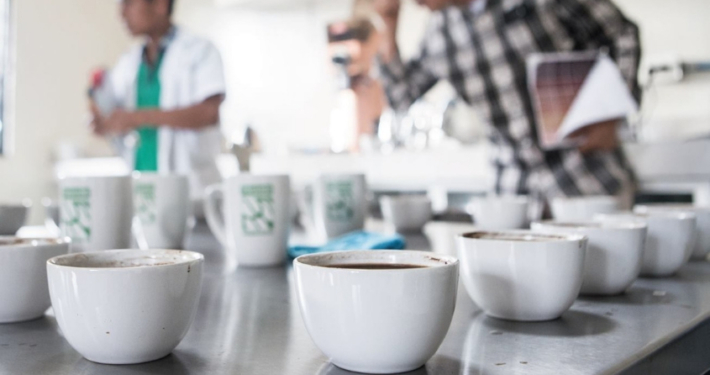 Because conversation around this issue is often inundated by misinformation and fear, we attempted to structure the week in a way that would encourage reflection and compassionate dialogue, rather than hate-fueled debate. 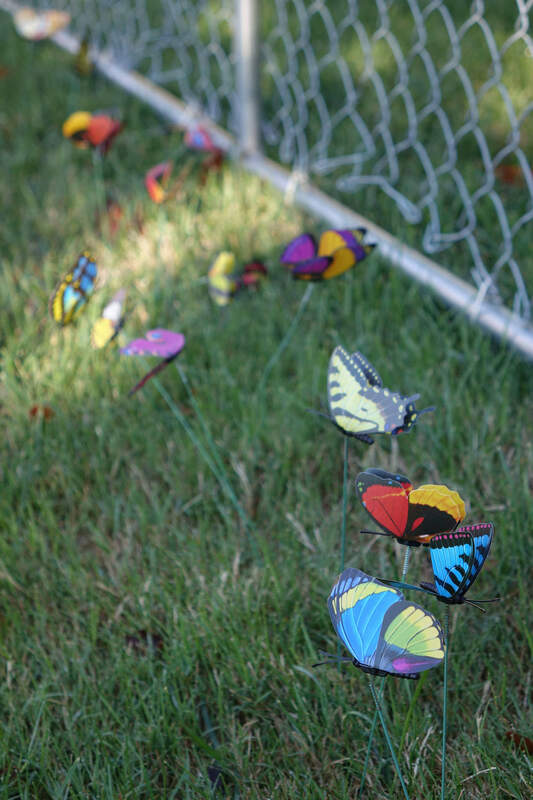 We kept Grace’s original idea of two sections of fencing, which stood on campus throughout the week of September 24th-28th. 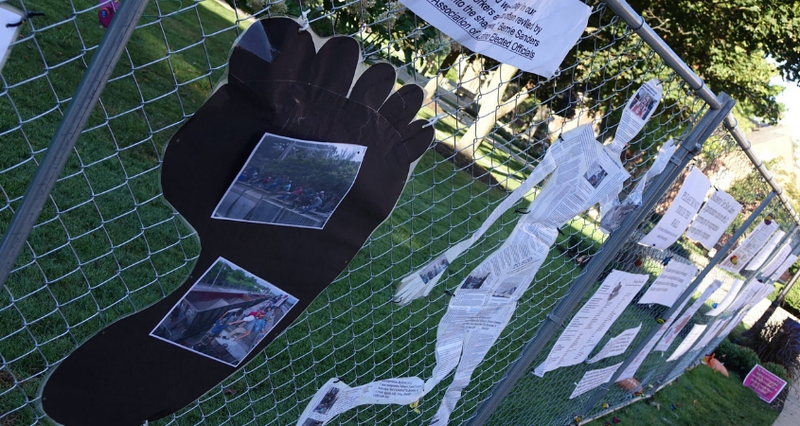 Our overall theme of the border wall project was to “build solidarity, not walls.” These sections were covered once again with statistics, quotes, and images centered around four themes: U.S. immigration policy, and the environmental cost, economic cost, and humanitarian cost of a border wall. We were lucky enough to collaborate with several student organizations who helped us compile this information, including the Latin American Student Association, the Environmental Issues Group, Black Students in Action, and the immersion group who had traveled to the U.S.-Mexico border this past summer. 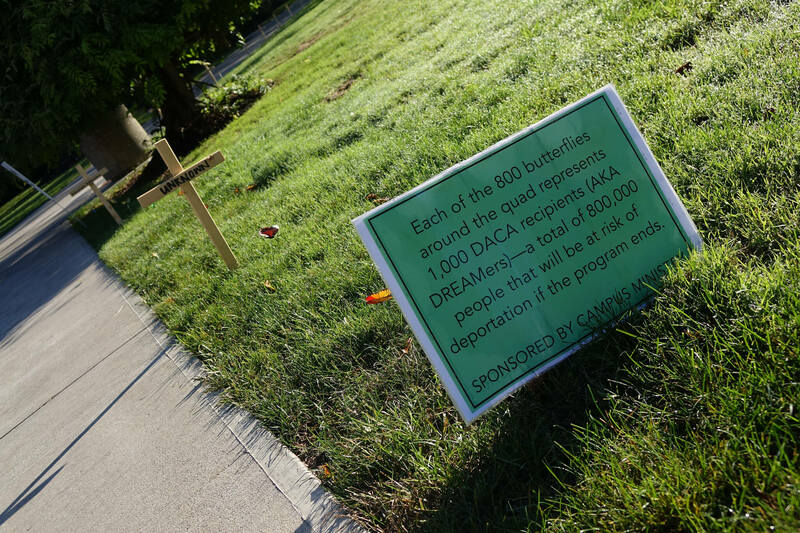 Because the two sections of fence were on opposite ends of campus, we decided to place crosses, representing the 412 individuals killed crossing the border in 2017, on the quad in the middle of campus so that regardless of where students were, they would be exposed to this powerful imagery. 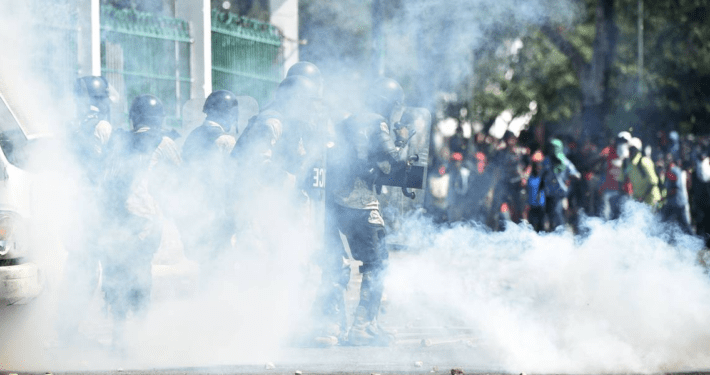 Additionally, we accompanied these symbolic statements with a week of events designed to spark healthy, compassion-based dialogue on the topic. On Monday, we held a kick-off event to discuss our purpose in bringing the wall to campus, and each of the groups who helped us gather information for the wall shared a little bit about what they had learned. Also at this event, we went over the University’s protest policy and informed students on how to have constructive, not argumentative, discussions with their peers. On Wednesday, we held a debate sponsored by JCU’s exceptional debate team where students could constructively engage with each other over their opposing views of the issue. On Thursday, we collaborated with the political science department to host an off-campus panel discussion composed of students who had traveled to the border with an immersion group the previous summer and who were able to share the personal impact of witnessing the immigration issue first hand. 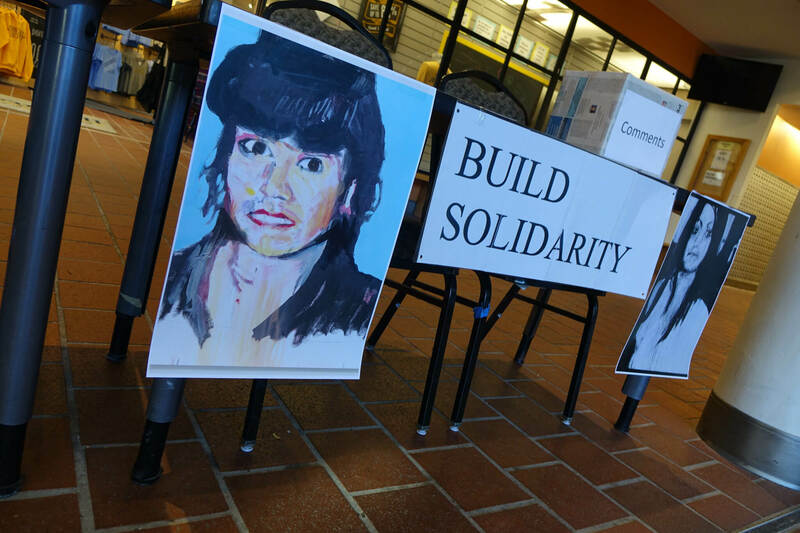 Also on Thursday, there was a documentary showing of “Blood Rising.” Brian Maguire is an Irish artist whose portraits of the murdered women of Juarez, Mexico attempted to raising awareness about the disappeared women of Juarez. He came for the showing of his documentary and discussed his work and efforts afterward. 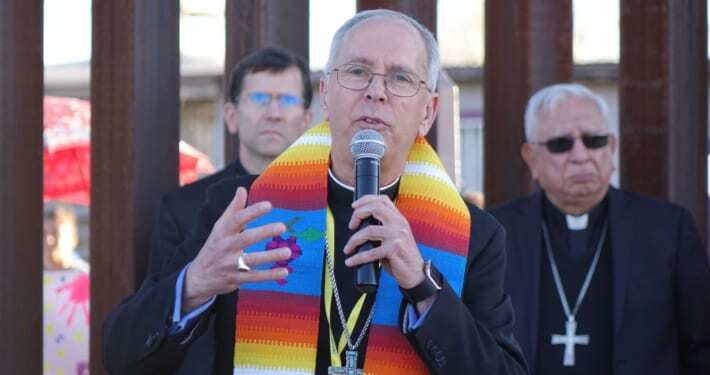 Finally, on Friday we held a prayer service where we prayed for all those who have died crossing the border, and for the continued strength and healing of those impacted by U.S. immigration policy. A comment box in the John Carroll University student center allowed the campus community to voice feedback and opinions. The debate held on Wednesday night generated a great turnout—anyone who wanted to voice their opinion on the matter could do so in a safe and respectful environment. 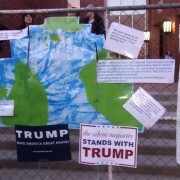 During this event, several students with personal experiences with immigration voiced their frustrations and engaged with students who want to see a border wall. 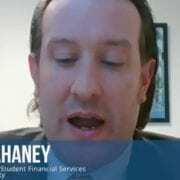 While both groups of individuals clearly felt strongly about their respective opinions, and exchanges were tense, the conversation remained respectful. 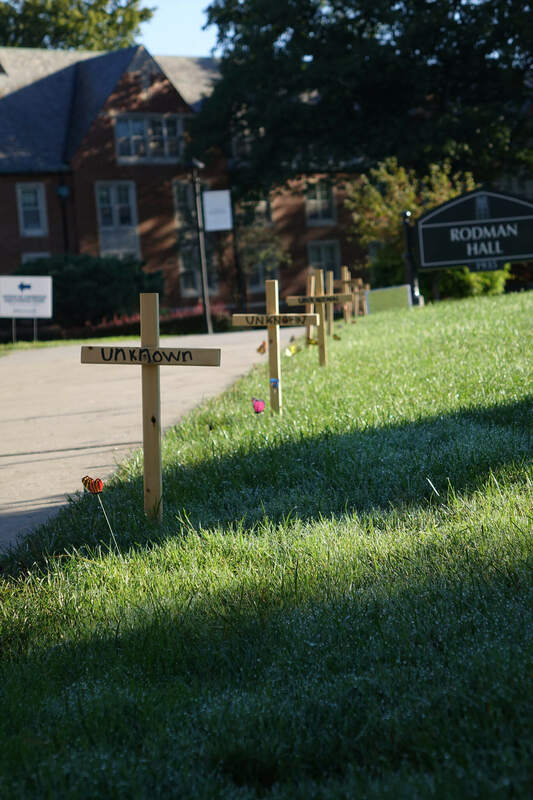 As we were taking down the display of crosses at the end of the week, a woman from the local neighborhood stopped us to express her gratitude that we had brought this project to campus. She felt the crosses were an incredibly powerful symbol of the human cost to the immigration debate that is too often forgotten. Katie Burns, Liz Nies, and Julie Whitmore are students at John Carroll University. Katie Burns is a senior, double majoring in Accountancy and Peace, Justice, and Human Rights. She is from Buffalo, NY but will be remaining in Cleveland after graduation to start as a Tax Associate at PwC. However, she will remain an advocate for social justice. Liz Nies is a senior Sociology major from Erie, Pennsylvania. She is minoring in Political Science and Peace, Justice, and Human Rights. Following graduation, she is hoping to get her master’s degree in Social Work and enter the foster care and adoption field. Julie Whitmore is a junior political science major along with entrepreneurship minor from Cleveland, Ohio. She is involved in fair trade projects, went on an immersion to Nicaragua that focused on fair trade and workers’ rights, and works closely with peace, justice, and human rights events on campus. She looks forward to her commitment to social justice and peace for her last year at John Carroll. Spending energy and resources for building bridges is the way forward. A Faithful Witness Christ the King!